Purpose: We describe the piezo-osteotomy feasibility in rehabilitation and harvesting of osteo-odonto lamina in modified osteo-odonto keratoprosthesis (MOOKP) surgery. Surgery was evaluated regarding operative technique and success of the keratoprosthesis (KPros) in terms of perception to light (+ve) to finger counting (+ve). Materials and Methods: This retrospective cohort study included 12 patients undergone MOOKP surgery procedures. 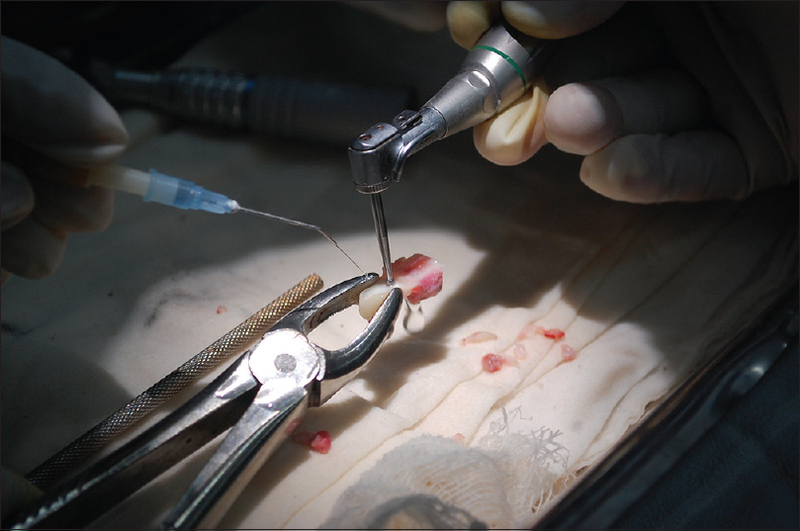 Harvesting of osteo-odonto-lamina was performed using piezosurgical osteotomy during 2007–2012. Results: The mean follow up was 34 months (range 24–48 months). Of the 12 patients six patients had vision ≥6/12, four patients had vision <6/12, but >6/60 and one patients had vision ≤6/60. KPros was retained and functional in all the eyes after a minimum follow up of 24 months. There was mucosal overgrowth over the optical cylinder occurred in two cases over 4 years follow up which was corrected with trimming. Postoperative complication at donor site was seen in three cases, two cases with exposure of root of adjacent teeth and oro antral fistula in one. Conclusions: This study suggests that piezoelectric harvest of osteo-odonto-lamina is a valuable surgical option in patients undergoing MOOKP surgery, resulting in high success rate with less complication. A keratoprosthesis (KPros) is an artificial corneal replacement for dry keratinized eye resulting from ocular cicatricial pemphigoid, Stevens–Johnson syndrome, trachoma, and chemical injury. Extrusion, glaucoma, retinal detachment, and retro prosthetic membrane formation are some of the complications associated with KPros. This entailed the use of a carrier media for the artificial cornea that would reduce the incidence of complications. Osteo-odonto keratoprosthesis (OOKP) is a surgical procedure to rehabilitate vision in blind patients utilizing their own tooth root and alveolar bone which acts as a foundation for the optical cylinder. This surgical technique was subsequently modified by Falcinelli et al. where he transferred buccal mucosa to the anterior surface of the eye after 1 month of stage I. The modified OOKP (MOOKP) has been documented as the ideal KPros due to its use as a biologic skirt including an autogenous osteo-odonto lamina. The Rome–Vienna protocol laid down the gold standard technique of MOOKP that should be followed. The MOOKP is a surgery requiring cumulative efforts from ophthalmic and maxillofacial surgeons. For the oral and maxillofacial surgeon performing the MOOKP procedure, the primary aim is the selection and resection of the largest available segment of tooth and bone consisting of intact, healthy, and viable periodontal ligament (PDL) which determines the long-term prognosis. To the best of our knowledge, there are no studies available reporting the use of piezoelectric surgery for the harvest of osteo-odonto lamina for MOOKP surgery optimizing its outcomes. Thus, here, we report the use of piezoelectric harvest of osteo-odonto lamina (PhOOL), discuss its advantages. This retrospective cohort study included 12 patients who were treated for OOKP surgery during 2007–2012 at our institute. There were eight females and four males with an average age of 33.84 ± 11.38 years were subjected to meticulous ocular and oral examination. 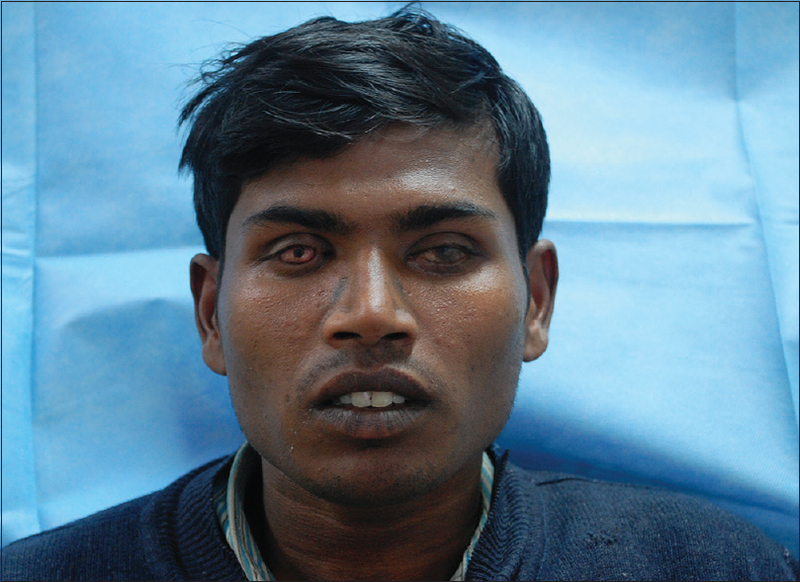 The inclusion criteria were bilateral blindness from severe, end-stage corneal and ocular surface diseases, eyes with intact retinal and optic nerve function whose conjunctival and lid abnormalities that are unamenable to conventional corneal grafting. Maxillary canine was used for all the patients as its ideal tooth due to its dimensions and the quality and quantity of surrounding bone. The included patients had a healthy viable buccal mucosa and maxillary canine root length >16 mm. Patients with maxillary canine teeth restored, having periodontal disease or caries, altered root morphology and having inadequate space with adjacent tooth and those having cicatrical diseases affecting the buccal mucosa were excluded from the study. Radiological examination included intra oral periapical radiograph, orthopantomogram and a computed tomography scan to evaluate the cuspid in both mesiodistal and buccolingual dimensions [Figure 1]. All the patients underwent thorough oral prophylaxis and an informed written consent was obtained from all of them. MOOKP surgery is a staged and relatively invasive procedure requiring maxillofacial expertise. Stage 1 includes two steps, first includes preparation of osteo-odonto lamina and second one includes implantation of the buccal mucosa in the eye. Local anesthetic with adrenaline (lignocaine 2% with adrenaline 1:2 lac) was infiltrated around the selected tooth. An incision was made to the bone. Cutting the bone on mesial and distal side was performed with a ultrasonic device, the Piezotome Solo (Satelec, Action Group, Merignac, France), at 50 Hz, with an ultrasonic frequency of 28 kHz (this frequency works only on mineralized tissue without activation on nonmineralized tissue), using a D1 program with 90-mL/min irrigation flow rates for better potency. BS5 and BS6 (Piezotome 2, Satelec, Acteon) tips were used, with the movement of 80 mm. The apical cut was given about 5 mm above the root tip of the canine. Care was taken to avoid root surface of the adjacent teeth [Figure 2]. The osteodental block also known as lamina was fashioned to receive the ocular prosthesis by removing the soft tissue and bone from one-half of the root. This side of the root was sectioned sagittally with a diamond edged disc and removed to expose the dentin and pulp chamber. The pulp was extirpated and excess alveolar bone trimmed to shape a rectangular cube of average dimensions 12 mm width, 16 mm length, and 4 mm thickness with dentine on one side and bone on the other. A 3–3.5 mm diameter hole, circumscribed by a 1.5 mm thickness of dentin was drilled in the widest part on the root using sequential drilling (2.0 mm, 2.5 mm, 2.8 mm, 3.2 mm, and 3.5 mm), to avoid disproportionate stresses to the peri-cylinder alveolo-dental ligament [Figure 3] and [Figure 4]. A polymethylmethacrylate cylinder of suitable power was fixed in this opening using methylmethacrylate self-curing resin. The power of the polymethylmethacrylate cylinder was determined from the axial length of the eye. This cylinder channels light onto the retina [Figure 5]. The crown was removed prior to drying with filtered oxygen and cementing of the optical cylinder. The completed KPros was implanted beneath the orbicularis oculi muscle in the cheek below the contralateral eye for subsequent OOKP insertion after 4–6 months. This step was carried out after 1 month of step 1 according to the standard procedure. This stage involved implantation of the OOKP or lamina onto the anterior bulbar surface. The lamina was retrieved from its sub muscular pouch and excess connective tissue was removed from the two ends of the optic cylinder. A template was made of the lamina to plan placement of a flieringa ring, and preplaced sutures for securing the lamina. The lamina was temporarily returned to its sub muscular pocket until the cornea was about to be trephined. The mucosal graft on the ocular surface was incised superiorly and reflected from the superior sclera and cornea. 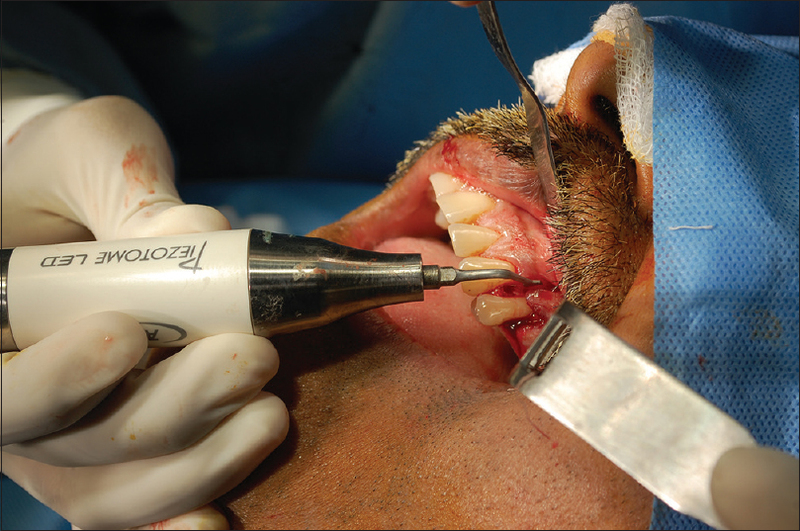 The inferior attachment of the mucosal graft was left undisturbed to ensure that the blood supply was retained. Intravenous mannitol was administered to reduce the intraocular pressure before trephination. A flieringa ring was sutured in place and a 3 mm opening was created in the center of the cornea. The iris was excised and the lens was cryoextracted intracapsularly. An anterior vitrectomy was performed. The lamina was then placed over the cornea, such that the posterior part of the optic cylinder was in the anterior chamber entering through the central corneal opening. The lamina was then sutured to the cornea with the posterior part of the optical cylinder traversing the corneal opening. Sterile air was then injected to reinflate the eye and indirect fundoscopy performed to ascertain adequate centration, to take note of the appearance of the posterior pole of the eye, and any presence of blood in the vitreous. After the cylinder and lamina were satisfactorily placed, the Flieringa ring was removed, mucosal flap was replaced and a small opening created over the optic cylinder to allow the anterior portion of the cylinder to protrude through the mucosa. The superior edge of the mucosal flap was sutured back in place. The patient was able to see after the surgery although it took about 2 weeks for the vision to stabilize. Suitable analgesic and oral antibiotics was prescribed for 1 week along with prednisolone 20 mg and lansoprazole 30 mg for 5 days. Patients were instructed to have only a semi-solid diet for 3 weeks. Sutures were removed after 7 days. The patients were kept under close follow up every 3 months and were examined for the oral and ophthalmologic status. The mean follow up was 34 months (range 24–48 months). The buccal mucosa of all 12 patients was of satisfactory nature and could be harvested easily. A visual analog scale from 0 to 10 was used to calibrate pain in the oral cavity. In the immediate postoperative period nine patients had a score of 7, two patients had a score of 4 and one had a score of 3. At the end of 1 week, all were pain free and were able to eat and drink comfortably. No difficulty in opening of the mouth in any patient was evident. An oroantral fistula developed in one patient, which resolved spontaneously (patient no. 7). Roots of adjacent teeth were exposed in two patients and their vitality was positive on using electric pulp testing (patient no. 3 and 9). In both the patients, at follow up period vitality of the teeth was positive, therefore, no intervention was done. Periodontal condition was assessed on the basis of clinical probing depth and quality of bone in radiographs. No periodontal degeneration was seen in any of the adjacent teeth. At the follow-up, slit lamp examination was carried out to assess mainly the vascularization of the mucous membrane. An ultrasound B-scan was carried out to know the status of posterior segment of the operated eye. B-scan did not reveal any retinal pathology, that is, detachment and vitreous abnormality, that is, hemorrhage or exudates. Snellen's chart was used to assess vision. Functional survival with success was defined as best-corrected visual acuity and anatomic survival with success defined as retention of the KPros lamina. Most patients had a preoperative vision of perception to light +ve to FC +ve. After OOKP, the visual outcome of the patients is as follows. Of the 12 patients, six patients had vision ≥6/12 [Figure 6], four patients had vision <6/12, but >6/60 and one patients had vision ≤6/60. Individual patient details are given in [Table 1]. The etiology of corneal blindness includes various infectious and inflammatory eye diseases that cause corneal scarring, which ultimately leads to functional blindness. Corneal diseases are among the major causes of global blindness. For over 200 years, a variety of prosthetic corneas made of materials such as champagne corks and hydroxyapatite have been implanted. The viability of the MOOKP depends on that of the various components of the osteo-odonto lamina, namely the periosteum, bone, PDL, and tooth. Each of these components uniquely contributes to the reconstruction of the oral environment on the surface of the affected eye and is considered to play a direct role in the success of the implantation. 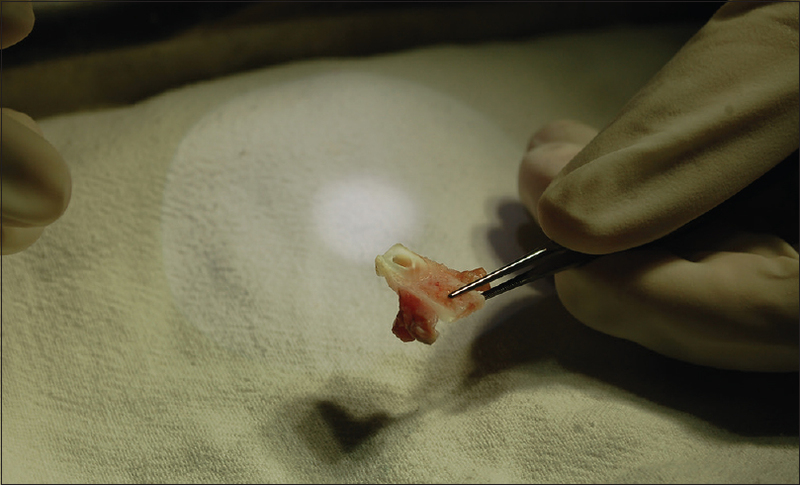 The donor tooth should be extracted with minimal trauma and transplanted with minimal extra-oral time, preserving the PDL to achieve a predictable outcome. The PDL contributes to the long-term survival of the transplant according to Falcinelli et al. The use of rotary surgical drills for this purpose can, however, lead to excessive high temperatures during bone cutting. It can also cause marginal osteonecrosis and impair regeneration and healing. If excessive force is applied to the tooth, the dentine itself may break, or the dentoalveolar ligament may be loosened during the preparation. Overheating from inadequate cooling may cause severe damage to the tissue followed by necrosis. Preserving the PDL of the tooth in such a scenario becomes extremely difficult and thereby, decreases the possibility of successful KPros. Till now, no improved innovative technique for harvest of osteo-odonto lamina has been proposed as a result of which conventional drills are still the method of choice hence compromising the outcome of the technique. Thus, the aim of our study was to preserve the PDL of the donor tooth utilizing the capabilities of piezosurgery for the purpose of successful harvesting of osteo-odonto-lamina. The maintenance of the alveolar-dental ligament seems to play a pivotal role in the preservation of the lamina itself. Stoiber et al. examined the histological features of 3 explanted OOKP laminas and found that the laminas with the least bony and dentinal resorption were those with the most intact PDLs. Even when there was resorption in the specimen, the dentin was retained where PDL was present. Epithelial down-growth between the mucosal surface and the edge of the device is prevented by the presence of the intact PDL. The PDL undergoes continuous remodeling, generating an abundance of fibroblasts and undifferentiated mesenchymal cells that have the potential to transform into mature fibroblasts, osteoblasts, and cementoblasts. Assuming that the PDL is involved with the survival of the osteo-odonto lamina, it becomes imperative that the bone encasing the tooth remain vital to maintain the PDL. The damaged tissues and necrotic cut ends of the osteotomy site obtained after the use of rotary surgical drills together with the postoperative inflammatory edema substantially reduce local perfusion and lead to hypoxia, which is one of the most important independent risk factors for preservation of osteo-odonto lamina. Hypoxia decreases the function of osteoblasts and induces a reversible state of quiescence in their metabolism. One study of an experimental piezo surgical osteotomy showed viable osteocytes with normal morphology and differentiation at the marginal osteotomy site. Falcenelli et al. document anatomical complications leading to OOKP loss were found in 11 (6.07%) of 181 patients. Survival analysis estimated that 18 years after surgery, the probability of retaining an intact OOKP was 85% (95% confidence interval, 79.3%–90.7%). Basu et al. found, the KPros was retained in all eyes at 24.1 ± 6.5 months postimplantation, and the probability of maintaining 20/60 or better vision was similar in eyes with or without mucosal necrosis (86% ± 8.8% vs. 80% ± 10.3%). Tan et al. conducted a systematic review of OOKP outcomes revealed that the average anatomic survival rate was 87.8% at 5 years and 81% at 20 years, with visual acuity more than 6/18 achieved in 52% of the operated eyes. De La et al. found the complications were extrusion (28%), retinal detachment (16%), and uncontrolled glaucoma (11%) over a mean follow-up time was 8.4 years. Iyer et al. have reported an anatomic success of 96% but functional success of visual acuity >/¼ 20/60 in 66% in fifty eyes of 47 patients who underwent modified OOKP procedure in bilateral end stage ocular surface disease. The complications they encountered were oroantral fistula (6%), trophic mucosal alterations (8%), lamina exposure (central 6% and peripheral 8%), mucous membrane overgrowth (2%), hypotony (2%), expulsion of optic cylinder (4%), endophthalmitis (2%), glaucoma (20%), sterile vitritis (6%), and retinal detachment (2%). Tay et al. found Seven of 13 patients (54%) have attained 6/6 vision, 9 of 13 (69%) have attained vision of at least 6/12 or better, whereas the rest have attained stable vision varying between 6/30 and 6/120 due to preexisting glaucomatous optic neuropathy and previous retinal detachment. In our series, six patients had vision ≥6/12, four patients had vision <6/12 but >6/60 and two patients had vision ≤6/60. KPros was retained and functional in all the eyes after a minimum follow up of 24 months. Mucosal overgrowth over the optical cylinder occurred in two cases over 4 years follow up which was corrected with trimming. As compare to above studies, we have seen higher success rate of the surgery with less complications, which could be attributed to use of piezosurgery, owing to its selective cut that recognizes the hardness of tissues and works only on mineralized structures, and hence it causes no damage to adjacent soft tissues (maxillary sinus). In a study by Narayanan et al., he reported the oro-antral fistula in four patients (15.38%) and exposure of adjacent root in 12 patients (46.15%), this high prevalence of complications can be attributed to the use of traditional rotary cutting instruments which generates sufficient heat with subsequent tissue damage. However, the study had inherent drawbacks of a retrospective study design, the small sample size does not permit us to draw major conclusions. Further research and randomized controlled trials comparing piezosurgery with conventional drills in MOOKP surgery is required. We have concluded that PhOOL is a valuable surgical option in patients undergoing MOOKP surgery. Using proper case selection, performing adequate preparation of the donor and recipient site and minimizing damage to the osteo-odonto lamina ensure high success rates. The management of the flap and careful manipulation of tissue is a requisite for the preparation of ideal osteo-odonto lamina which is best possible with the use of piezoelectric device. The future of MOOKP is promising, as the literature and scientific interest is increasing. Liu C, Paul B, Tandon R, Lee E, Fong K, Mavrikakis I, et al. The osteo-odonto-keratoprosthesis (OOKP). Semin Ophthalmol 2005;20:113-28. Falcinelli G, Falsini B, Taloni M, Colliardo P, Falcinelli G. Modified osteo-odonto-keratoprosthesis for treatment of corneal blindness: Long-term anatomical and functional outcomes in 181 cases. Arch Ophthalmol 2005;123:1319-29. Sawatari Y, Perez VL, Parel JM, Alfonso E, Falcinelli G, Falcinelli J, et al. Oral and maxillofacial surgeons' role in the first successful modified osteo-odonto-keratoprosthesis performed in the United States. J Oral Maxillofac Surg 2011;69:1750-6. Hille K, Grabner G, Liu C, Colliardo P, Falcinelli G, Taloni M, et al. Standards for modified osteoodontokeratoprosthesis (OOKP) surgery according to Strampelli and Falcinelli: The Rome-Vienna Protocol. Cornea 2005;24:895-908. Garg R, Khanna P, Sinha R. Perioperative management of patients for osteo-odonto-kreatoprosthesis under general anaesthesia: A retrospective study. Indian J Anaesth 2011;55:271-3. Arora S. Corneal transplantation: Dental lamina as keratoprosthesis. Clin Rev 2010;7:11-4. 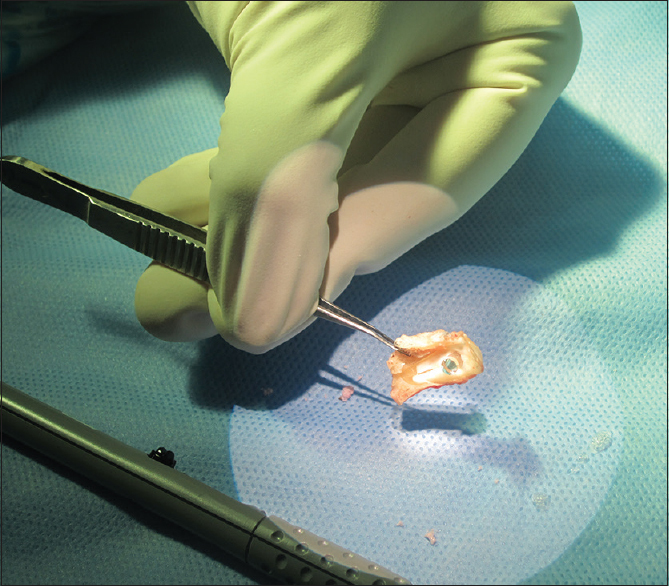 Jose A, Nagori SA, Virkhare A, Bhatt K, Bhutia O, Roychoudhury A. Piezoelectric osteoarthrectomy for management of ankylosis of the temporomandibular joint. Br J Oral Maxillofac Surg 2014;52:624-8. Pavlíková G, Foltán R, Horká M, Hanzelka T, Borunská H, Sedý J. Piezosurgery in oral and maxillofacial surgery. Int J Oral Maxillofac Surg 2011;40:451-7. Stoiber J, Csáky D, Schedle A, Ruckhofer J, Grabner G. Histopathologic findings in explanted osteo-odontokeratoprosthesis. Cornea 2002;21:400-4. Tay AB, Tan DT, Lye KW, Theng J, Parthasarathy A, Por YM. Osteo-odonto-keratoprosthesis surgery: A combined ocular-oral procedure for ocular blindness. Int J Oral Maxillofac Surg 2007;36:807-13. Beertsen W, McCulloch CA, Sodek J. The periodontal ligament: A unique, multifunctional connective tissue. Periodontol 2000 1997;13:20-40. Arnett TR. Acidosis, hypoxia and bone. Arch Biochem Biophys 2010;503:103-9. Landes CA, Stübinger S, Rieger J, Williger B, Ha TK, Sader R. Critical evaluation of piezoelectric osteotomy in orthognathic surgery: Operative technique, blood loss, time requirement, nerve and vessel integrity. J Oral Maxillofac Surg 2008;66:657-74. Basu S, Pillai VS, Sangwan VS. Mucosal complications of modified osteo-odonto keratoprosthesis in chronic Stevens-Johnson syndrome. Am J Ophthalmol 2013;156:867-73.e2. Tan A, Tan DT, Tan XW, Mehta JS. Osteo-odonto keratoprosthesis: Systematic review of surgical outcomes and complication rates. Ocul Surf 2012;10:15-25. De La Paz MF, De Toledo JÁ, Charoenrook V, Sel S, Temprano J, Barraquer RI, et al. Impact of clinical factors on the long-term functional and anatomic outcomes of osteo-odonto-keratoprosthesis and tibial bone keratoprosthesis. Am J Ophthalmol 2011;151:829-39.e1. Iyer G, Pillai VS, Srinivasan B, Falcinelli G, Padmanabhan P, Guruswami S, et al. Modified osteo-odonto keratoprosthesis – The Indian experience – Results of the first 50 cases. Cornea 2010;29:771-6. Narayanan V, Nirvikalpa N, Rao SK. 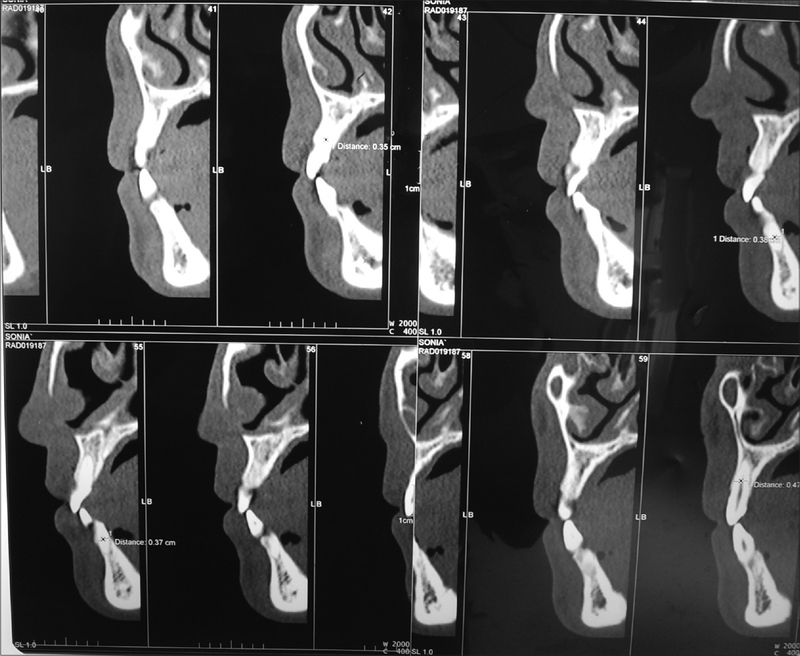 Osteo-odonto-keratoprosthesis – A maxillofacial perspective. J Craniomaxillofac Surg 2012;40:e426-31.